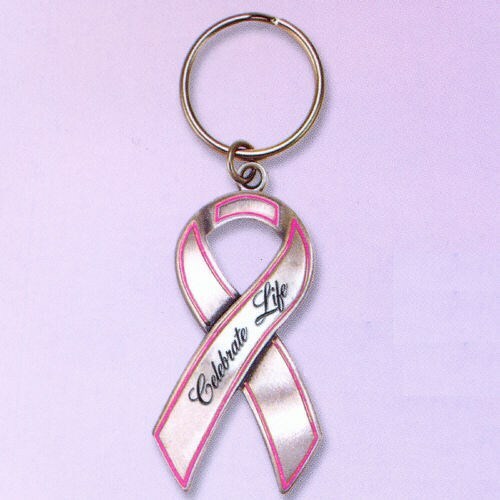 Show your support in a cure for Breast Cancer with this Celebrate Life Breast Cancer Awareness Keychain. Our Breast Cancer Awareness Key Ring makes a great gift for loved ones. Help support the fight against Breast Cancer with our breast cancer awareness merchandise. Measures 2 1/2" in length. Ask about our Volume Discounts. The look on her face when she opened her gifts was priceless. This is a nice heavy key chain. GiftsForYouNow.com has many additional Breast Cancer Awareness Gifts for your special gift giving needs. Each time a gift is purchased from our Breast Cancer Awareness line of personalized gifts, GiftsForYouNow.com will make a donation of 15% of the purchase price to help in the fight against breast cancer.